Brought to you by The American Thread Co. Star Book No. 182! This hat is equal parts kitschy cute and retro goofy. I made one of these forever ago and finished it with the ribbon tie. Of course when I re-discovered this I had to make up a new one and try out the tassel version. Now I’m walking around the house as if I’m Barbara Eden. I fell in love with a 1960s brimmed hat and didn’t have the pattern so this is what I came up with. Worked in the round with worsted weight wool. Brim is knit separately and sewn on. 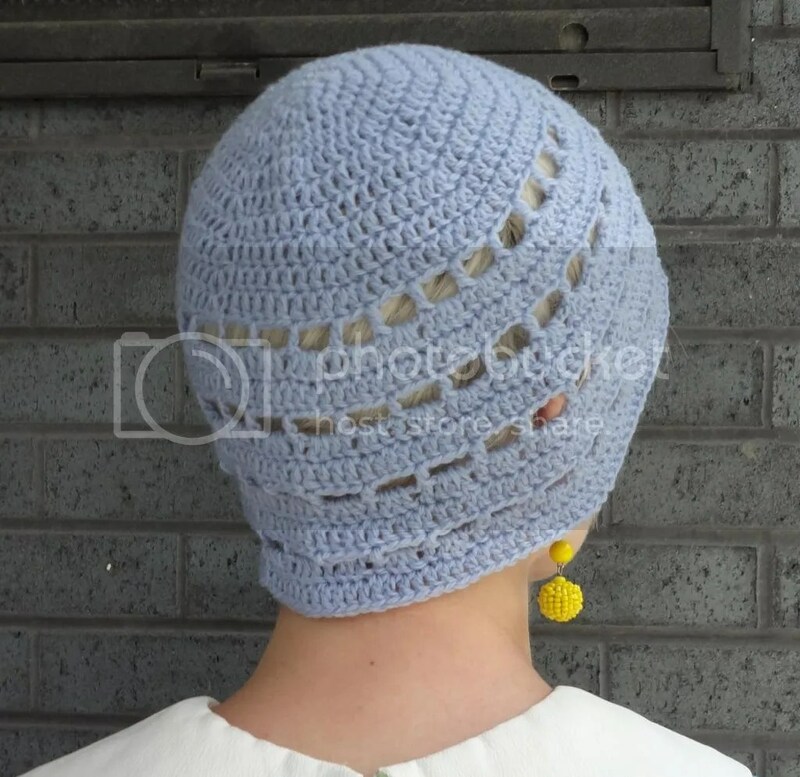 You can purchase this hat on Etsy or download a pattern PDF at the link below. Notes: Body of hat is worked in the round with a brim that is worked flat and sewn on. Purl 9, slip 1 stitch purl-wise with yarn in back. Repeat across row. Purl 9, knit 1. Repeat across row. Purl 7, purl 2 stitches together, slip 1 stitch purl-wise. Repeat across row. Purl 8, knit 1. Repeat across row. P6, p2tog, sl st. Repeat. P5, p2tog, sl st. Repeat. P4, p2tog, sl st. Repeat. P3, p2tog, sl st. Repeat. P2, p2tog, sl st. Repeat. P1, p2tog, sl st. Repeat. Pull yarn through remaining 7 stitches. Finish off. Knit into front and back of stitch. K2, knit two stitches together, k3. Finish off. Sew brim onto bottom edge of hat using whip stitch. 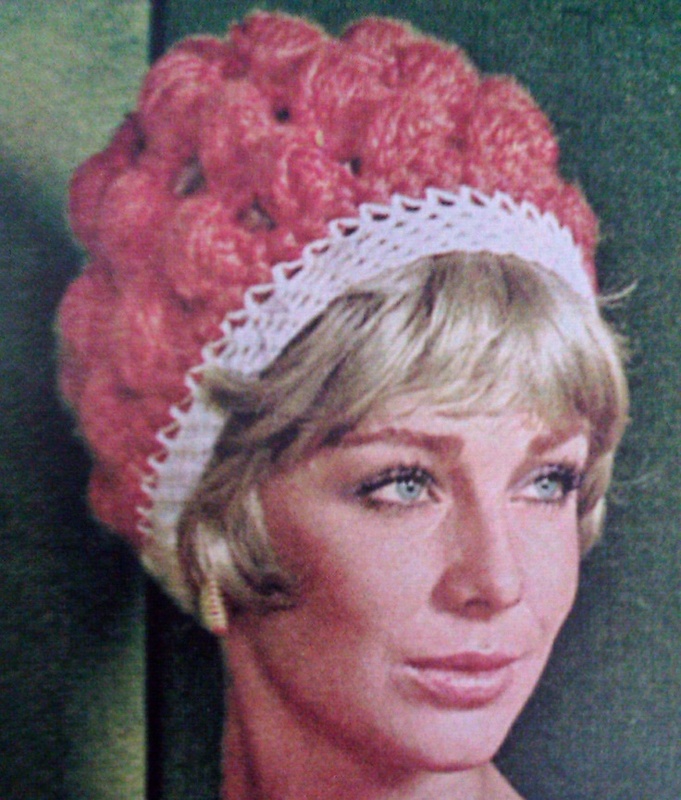 This hat idea was born during my quest to find crochet cloche patterns thanks to Bonnie and Clyde. I couldn’t find a pattern for what I pictured in my head so I made it up as I worked. Made entirely in the round using one ball of yarn and only 23 rows (!!) of crochet. Pretty quick and lightweight project. Download a PDF at link below, check it out on Ravelry, or purchase this hat on Etsy. This hat is worked entirely in the round beginning at the crown. Be sure to chain 2 at the start of each non-eyelet round as the first half-double crochet. Each non-eyelet round is joined with a slip stitch into the first chain 2 of that round. Eyelet rounds are joined to the 3rd chain of the first ch 6 of that round. I used a magic ring to start my rounds but use whatever method you like best. 12) Ch 6, * dc in 3rd dc, ch 3. Repeat from * around. Sl st into 3rd chain of starting ch 6. 13) Ch 2, * 3 dc into loop, 1 dc in each dc. Repeat from * around. 14) Ch 2, dc in each dc. 15) Ch 6, * dc in 3rd dc, ch 3. Repeat from * around. 16) Ch 2, * 3 dc into loop, 1 dc in each dc. Repeat from * around. 17) Ch 2, dc in each dc. 18) Ch 6, * dc in 3rd dc, ch 3. Repeat from * around. 19) Ch 2, * 3 dc into loop, 1 dc in each dc. Repeat from * around. 20) Ch 2, dc in each dc. 21) Ch 6, * dc in 3rd dc, ch 3. Repeat from * around. 22) Ch 2, * 3 dc into loop, 1 dc in each dc. Repeat from * around. 23) Ch 2, dc in each dc. Finish off. Here is another of the vintage-inspired hat patterns I created in my design frenzy last fall. I named this asymmetrical cloche “canceled stamp” after the 1920s term for a wallflower. The shaping is created using short rows along the bottom edge of the hat, one side is just a little longer than the other. Made of worsted weight yarn so it knits up fairly quickly for a vintage style hat. You can purchase this hat on Etsy. Download a PDF of the pattern at the link below or find it on Ravelry. Short row shaping: (I will only provide a brief review here as there are numerous tutorials available online.) On a knit row: knit the number of stitches to short row section, slip next stitch onto right needle as if to purl and bring yarn to front of work, return unworked slipped stitch back to left needle and turn work bringing yarn to the front with wrong side facing to begin purl row. On a purl row just wrap the yarn the opposite as you would when purling instead of knitting. Remember to hide the wraps when you encounter them by knitting them along with the wrapped stitch. 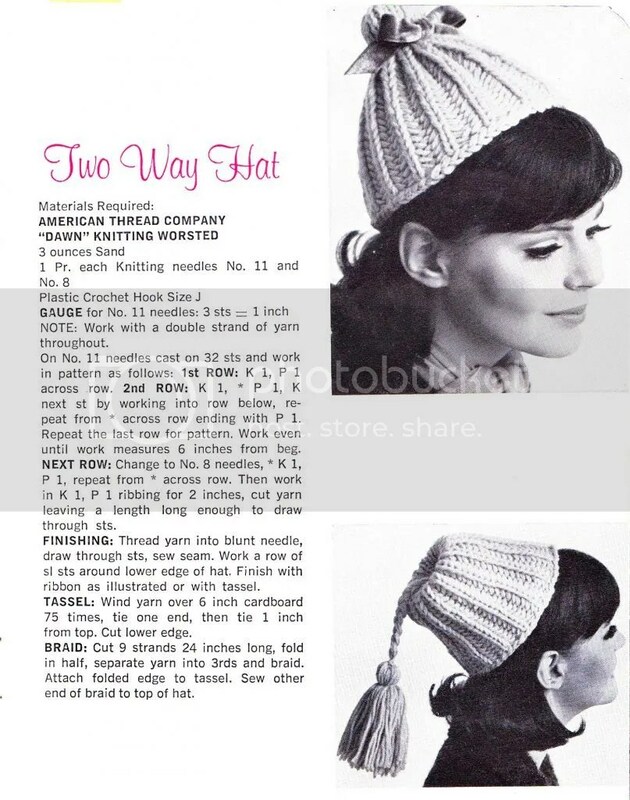 The main body of the hat is knit in the round but the short row shaping section is knit back and forth. Hat uses short row shaping only on one side and is worn asymmetrically as shown in photos. Cast on 90 stitches using second color and join in the round. Place stitch marker for start of rounds if desired. Work in garter stitch for two rounds beginning with a purl round. At the start of the next round, change to main color and knit 22 stitches, place second marker (for center of short rows section), knit to start of round. 1) Knit to 6 stitches past short rows section marker (28 stitches past join in the round marker), wrap yarn and turn work. 2) Purl to 6 stitches past marker, w&t. 3) K to 8 sts past marker, w&t. 4) P to 8 sts past marker, w&t. 5) K to 10 sts past marker, w&t. 6) P to 10 sts past marker, w&t. 7) K to 11 sts past marker, w&t. 8) P to 11 sts past marker, w&t. 9) K to 12 sts past marker, w&t. 10) P to 12 sts past marker, w&t. 11) K to 13 sts past marker, w&t. 12) P to 13 sts past marker, w&t. 13) K to 14 sts past marker, w&t. 14) P to 14 sts past marker, w&t. 15) K to 15 sts past marker, w&t. 16) P to 15 sts past marker, w&t. 17) K to 16 sts past marker, w&t. 18) P to 16 sts past marker, w&t. 19) K to 17 sts past marker, w&t. 20) P to 17 sts past marker, w&t. 21) K to 18 sts past marker, w&t. 22) P to 18 sts past marker, w&t. 23) K to 19 sts past marker, w&t. 24) P to 19 sts past marker, w&t. 25) K to 20 sts past marker, w&t. 26) P to 20 sts past marker, w&t. 27) K to 21 sts past marker, w&t. 28) P to 21 sts past marker, w&t. 29) K to 22 sts past marker, w&t. 30) P to 22 sts past marker, w&t. Continue to work all stitches in stockinette stitch for approximately 3 ¾ inches from unshaped cast on edge. 1) K7, k2tog, k7, ssk. * Repeat from * around. 3) K6, k2tog, k6, ssk. * Repeat from * around. 5) K5, k2tog, k5, ssk. * Repeat from * around. 7) K4, k2tog, k4, ssk. * Repeat from * around. 9) K3, k2tog, k3, ssk. * Repeat from * around. 11) K2, k2tog, k2, ssk. * Repeat from * around. 13) K1, k2tog, k1, ssk. * Repeat from * around. 15) K2tog, ssk. * Repeat from * around. Finish off by pulling yarn through remaining stitches. Be sure to block finished hat so that cast on edge does not roll! I was fortunate enough a few years ago to find an amazing Drtiz booklet from 1945 filled with crocheted accessories. I have a PDF scan of all 48 patterns available on Etsy but I am going to share this page with two darling hat and muff sets here on the blog. *This hat has lots of stretch so gauge isn’t *that* important. As long as you can match the smaller needle gauge for the rib, just use a needle that is two sizes larger for the rest of the hat! 1) yo, k3, [sl, k2tog, psso,] k3, yo, p3. * Repeat from * around. 2) k9, p3. * Repeat from * around. 3) k1, yo, k2, [sl, k2tog, psso,] k2, yo, k1, p3. * Repeat from * around. 4) k9, p3. * Repeat from * around. 5) k2, yo, k1, [sl, k2tog, psso,] k1, yo, k2, p3. * Repeat from * around. 6) k9, p3. * Repeat from * around. 7) k3, yo, [sl, k2tog, psso,] yo, k3, p3. * Repeat from * around. 8) k9, p3. * Repeat from * around. Cast on 120 stitches using US 6 needles and join in the round. Work in knit one, purl one rib for 1 1⁄4 inches. On next round, switch to US 8 needles and work in lace pattern for a total of 7 inches from cast on edge. – Be sure to keep purl stitches intact (this makes the swirl at the top of that hat!) and only decrease within the knit stitches until there are no more knit stitches. 1) K2tog, k7, p3. * Repeat from * around. 2) K2tog, k6, p3. * Repeat from * around. 3) K2tog, k5, p3. * Repeat from * around. 4) K2tog, k4, p3. * Repeat from * around. 5) K2tog, k3, p3. * Repeat from * around. 6) K2tog, k2, p3. * Repeat from * around. 7) K2tog, k1, p3. * Repeat from * around. 8) K2tog, p3. * Repeat from * around. 9) K2tog, p2. * Repeat from * around. 10) K2tog, p1. * Repeat from * around. 11) K2tog. * Repeat from * around. Finish off by pulling yarn through remaining stitches.